Road Trip, originally uploaded by Folkcat. On our way to Concord to pick up new foster girls – the Sound FX Girls and Mia. New Day Different Rat, originally uploaded by Folkcat. Laurel takes her turn sleeping in the hose "window". Sleepy Girl!, originally uploaded by Folkcat. 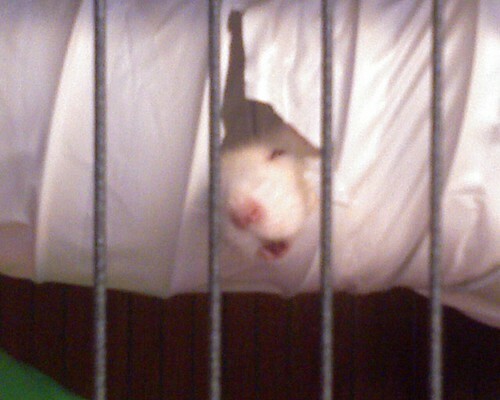 Caught Isabella, sound asleep and hanging her head out a window the rats chewed in their vent hose. I know, I know – I’ve been too long without posting. It’s been kind of a rough time here, and very busy as well. Since last I posted, we’ve had 10 foster girls come and go that you haven’t even heard about! There were the Mystery Girls: Sookie Stackhouse, Stephanie Plum, KoKo, and Sneaky Pie. There was the fizzy 4-pack that we called the Soda Pop Girls – Moxie, Fanta, Faygo, and Shasta. Then there was a very special pair, older girls Net-Net and Missy. Yes, that’s the same Net-Net who, with her litter of babies, was my very first foster case. The one who bit me five times, sending me to the emergency room once. Net-Net’s owner reached a point where she had significant changes in her life that made it impossible to give her rats the care they deserved. So she surrendered them all to Mainely Rat Rescue. Since I’d had Net-Net before, it made sense for her to come back. I was promised she wasn’t a biter, now that she didn’t have babies. Not entirely true. Net-Net and Missy both made attempts at biting Gryphon right away. Me – well, with me they were what I came to call toothy, but not biting. I could pick them up (Gryphon couldn’t), and handle them, and even take them in on my bed to romp under the blankets. And all I ever got was a Tooth Touch to the arm, hand, even the nose or chin – a gentle touching of the teeth to a body part, not a bite. The Tooth Touch sometimes became a Slow Bite. Not an aggressive motion, but a slow and considered one. I took the Tooth Touch and the Slow Bite both to mean they were trying to communicate, not express anger or fear. The Slow Bite is a case of a Tooth Touch that doesn’t know it’s own strength. If you are quick enough, you can pull away from them. I was slow one night, and Missy actually broke the skin on my ear. Ouch! So, here we were with a pair of older girls (over 18 months, elderly for a rat), with a temperament issue. And in addition to that, they both developed tumors. What was intended to be foster care in contemplation of finding an adoptive home, became hospice care. Net-Net’s tumor grew rapidly, and it was the ever-increasing size of her lump that set the deciding point for the next phase. 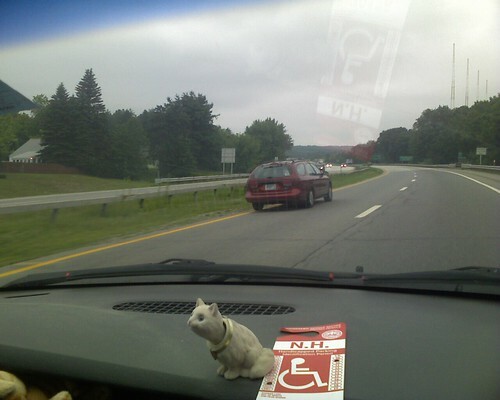 We parted company with Net-Net and Missy last week, sending them on their final journey to the top people at MRR. The head honcho herself is a certified euthanasia technician, so I can rest assured that they were handled gently, with great care and respect. Net-Net will always hold a special place in my heart. She was the rat who got me started on this path to greater involvement with Mainely Rat Rescue. On her first visit, she instilled in me a great fear of being bitten by aggressive rats. On her last stay, I came to understand her behavior better, to see the toothiness for what I believe it really is – an attempt by an intelligent rat to communicate with the living beings who provide her daily care. In the end, Net-Net, Missy, and I developed a mutual respect, and dare I say, even a friendship, for each other. I think they knew that in their final home, they were loved and cared for as their own cantankerous selves. Next time: The Mystery Girls! I’ve been trying to screw up the courage to write this post for a few days now. 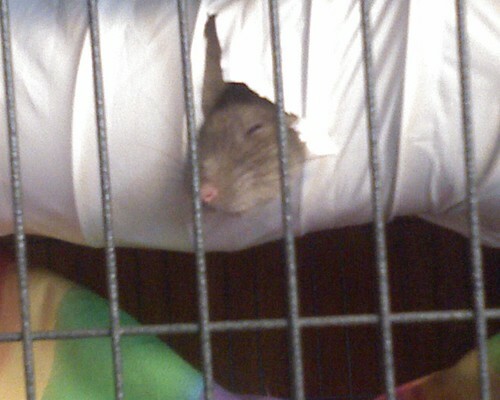 This past Saturday afternoon, our best beloved Rattie, Lola, passed away in my arms. Lola was about 2 years, 3 1/2 months old. As we sat ready to eat our Saturday breakfast (which is around 1 p.m. for us), Gryphon noticed that she was lying in the nest box, gasping for breath. He gently removed her from the cage and handed her to me. Lola was struggling for air, but seemed glad of the comfort. Her breathing troubles waxed and waned over the next two hours. At intervals she would scramble to drag herself to another spot, as if hoping to escape the pain and discomfort. She was so weak, she couldn’t raise her body and stand. Finally, a few minutes after 4 p.m., she had a few spasms that appeared to be a final seizure. Her little fists clenched and pawed at her face as if washing it. Then, lying on her side on my chest, with my hands covering her, she went still. I cried. I have cried at least once every day since. I see her face all around me. We have lost other rats before. We loved every one of them, and each loss hurt. But not like this one. Lola was special. Both Gryphon and I feel like we’ve lost a soul mate. She came to us originally in mid July of 2007. We found her at a local PetCo, a surrendered rat hoping to be adopted. They claimed she was five months old at the time. It may have been true – she was less than full size, but no longer a baby. We ultimately decided to approximate her birthday as February 18, 2007. The most astonishing thing was that she kept jumping out of the tank she was kept in, to climb onto my shoulder, then jump back down and repeat the process. Over and over again. Clearly, she didn’t want us to leave her. We brought her home, a spunky young teenager, to live with our aging girls Star and Sable. Star had clear health issues – a growing tumor, and a history of seizures and possibly even strokes. Sable was getting up there, but still functioning well. Star succumbed to her health problems on August 14. By then, Lola was able to keep Sable company. Their companionship kept Sable going until January, at which point the older girl passed away in our arms from respiratory failure. Lola became very depressed. We don’t know how long she may have been without rattie companionship before we adopted her, but she had come to love Sable, and she missed her big sister. Anxious to ease her loneliness, I got in touch with Mainely Rat Rescue. We adopted a pair of neutered boys, Yuri and Leonardo, a week after losing Sable. Lola had, from the start, been friendly, affectionate, and cuddly. Her personality had shown through at all ages, from her days as a bratty teenager picking on the old girls Star and Sable, to the flirty girl getting to know the boys we brought home for her. She became a protective mother figure when new girls were added – while still making sure they understood she wasn’t just a mother, she was The Queen Mother, thankyouverymuch. Since the start of 2009, Lola had started showing her age. She slowed down. She asked for more cuddles, spending up to an hour at a time just snoozing in my arms. She took on the role of curmudgeonly old woman, becoming more annoyed at the young whippersnappers she shared a cage with. In her most shining display of her true nature, when we tried to introduce Marbles into the colony cage, Lola turned out to be the only rat who accepted him. Every other one attacked him at every opportunity, but Lola slept with him, sometimes fended off his attackers, and kept him company when no others would. A short time later, we noticed a bulge starting to develop on Lola’s chest. Female rats are prone to mammary tumors, and at Lola’s age, surgery would be both costly and risky. So long as she had a reasonable quality of life, it was best just to help her live with it. She didn’t seem impaired, but did lose some weight and slowed down even more. The end finally came on Saturday, as I gave her what comfort I could, and told her if she had to leave it was okay, that we didn’t want her to suffer. I believe she went fairly peacefully. I hope she did. She was Lola. She was our love. Rest peacefully and well, our dear friend. You will always be in our hearts.